We live in a world where 1 billion people live in extreme poverty, with less than US$1.25/day. This is the same world where the market for super yachts is booming. 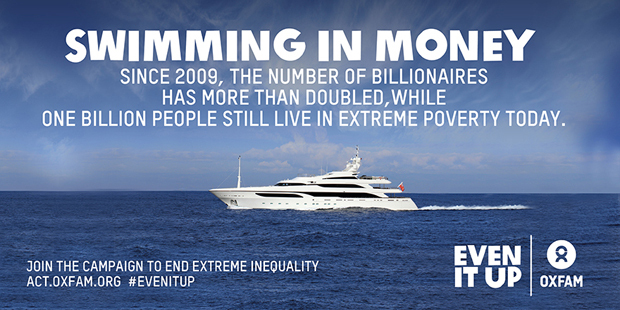 The 85 richest people in the world have the same wealth as the poorest 3.5 billion. The gulf between the haves and the have nots is enormous. In recent decades, poorer countries have been growing faster than richer ones and huge gains have been made in poverty reduction. Yet despite this, the world is just as unequal as it was 30 years ago. This is because the gap between the rich and the poor within countries has been growing, in many cases growing very quickly. In the US and China, Nigeria and Germany, the richest people capturing an ever increasing share of income and wealth are leaving the rest of us behind. This has not gone unnoticed. Obama has called it the “defining challenge of our time”, the World Economic Forum survey finds that severe income disparities are seen to be the biggest risk to the global economy. Oxfam has published a report that highlights the damaging consequences of high and rising economic inequality, from weakening growth and slowing poverty reduction to violence and instability. But the report also recognises that this is not inevitable. It details policies that can reverse this trend: better public services that put all citizens on a level playing field, progressive taxation and fair wages. So why is this not happening? Why are governments not implementing policies that will benefit the majority of citizens and create a more stable and just society? Why is it that our countries seem to work so that the rich get richer almost inevitably, whilst the rest of us get left behind? In 2013, Transparency International’s Global Corruption Barometer surveyed people in 107 countries, the majority of whom believed that their government was either entirely or to a large extent (by a few big entities) acting in their own best interests. Those at the rich end of the distribution have a range of options at their disposal to exercise undue influence and capture the policy-making space. Using money to buy policies, either directly with bribes or indirectly through political financing. Using relationships and special access to influence decision-makers, through revolving doors and secret lobbying meetings. Whilst people at the top use the resources and opportunities at their disposal to rig the rule in their favor – creating a vicious cycle that embeds their wealth and power further – ordinary people are fighting just to make a decent living and find that the space to be heard is closing. For progressive policies to be implemented, we must break the pernicious cycle of increasing concentration of income, wealth, power and influence. To do this we need to stop the corruption that allows those with power to influence policies that reflect the interests of a few. At the same time we need to provide transparency and accountability to citizens, to ensure that governments are being truly responsive to the interests of the majority. Oxfam is taking this seriously with its global campaign to Even It Up. ← Can big data solve the world’s problems, including corruption?